We live in an era of diminished expectations and, perhaps, diminished imagination. To most intellectuals the idea that the social world could be fundamentally changed in ways that would dramatically reduce the enormous inequalities in the world today and create the conditions in which all people could live flourishing lives seems naïve, perhaps even ridiculous. Capitalism reigns triumphant and at least in the developed capitalist world talk of socialism as an alternative has almost disappeared. I believe this radical pessimism and cynicism is itself a constraint on possibilities for creating a more just and humane world. Gramsci once described the struggle for social justice as requiring “pessimism of the intellect, optimism of the will.” I believe in the world today we need an optimism of the intellect as well: an optimism grounded in our understanding of the real potentials for emancipatory alternatives which can inform our practical strategies for social transformation. This is the basic goal of the Real Utopias Project. "Real Utopia" seems like a contradiction in terms. Utopias are fantasies, morally inspired designs for social life unconstrained by realistic considerations of human psychology and social feasibility. Realists eschew such fantasies. What is needed are hard-nosed proposals for pragmatically improving our institutions. Instead of indulging in utopian dreams we must accommodate to practical realities. The Real Utopia Project embraces this tension between dreams and practice. It is founded on the belief that what is pragmatically possible is not fixed independently of our imaginations, but is itself shaped by our visions. Self-fulfilling prophecies are powerful forces in history, and while it may be Pollyannaish to say "where there is a will there is a way", it is certainly true that without "will" many "ways" become impossible. Nurturing clear-sighted understandings of what it would take to create social institutions free of oppression is part of creating a political will for radical social changes to reduce oppression. A vital belief in a Utopian ideal may be necessary to motivate people to leave on the journey from the status quo in the first place, even though the likely actual destination may fall short of the utopian ideal. Yet, vague utopian fantasies may lead us astray, encouraging us to embark on trips that have no real destinations at all, or worse still, which lead us toward some unforeseen abyss. Along with "where there is a will there is a way", the human struggle for emancipation confronts "the road to hell is paved with good intentions". What we need, then, are "real utopias": utopian ideals that are grounded in the real potentials of humanity, utopian destinations that have accessible waystations, utopian designs of institutions that can inform our practical tasks of muddling through in a world of imperfect conditions for social change. The idea that social institutions can be rationally transformed in ways that enhance human wellbeing and happiness has a long and controversial history. On the one hand, radicals of diverse stripes have argued that social arrangements inherited from the past are not immutable facts of nature, but transformable human creations. Social institutions can be designed in ways that eliminate forms of oppression that thwart human aspirations for fulfilling and meaningful lives. The central task of emancipatory politics is to create such institutions. On the other hand, conservatives have generally argued that grand designs for social reconstruction are nearly always disasters. While contemporary social institutions may be far from perfect, they are generally serviceable. At least, it is argued, they provide the minimal conditions for social order and stable interactions. These institutions have evolved through a process of slow, incremental modification as people adapt social rules and practices to changing circumstances. The process is driven by trial and error much more than by conscious design, and by and large those institutions which have endured have done so because they have enduring virtues. This does not preclude institutional change, even deliberate institutional change, but it means that such change should be piecemeal, not wholesale ruptures with existing arrangements. At the heart of these alternative perspectives is a disagreement about the relationship between the intended and unintended consequences of deliberate efforts at social change. The conservative critique of radical projects is not mainly that the emancipatory goals of radicals are morally indefensible -- although some conservatives criticize the underlying values of such projects as well -- but that the uncontrollable, and usually negative, unintended consequences of these efforts at massive social change inevitably swamp the intended consequences. Radicals and revolutionaries suffer from what Frederick Hayek termed the "fatal conceit" -- the belief that through rational calculation and political will, society can be designed in ways that will significantly improve the human condition. Incremental tinkering may not be inspiring, but it is the best we can do. Of course, one can point out that many reforms favored conservatives also have massive, destructive unintended consequences. The havoc created in many poor countries by World Bank structural adjustment programs would be an example. And furthermore, under certain circumstances conservatives themselves argue for radical, society-wide projects of institutional design, as in the proposals for "shock therapy" as a way of transforming command economies into free-market capitalism. Nevertheless, there is a certain apparent plausibility to the general claim by conservatives that the bigger the scale and scope of conscious projects of social change, the less likely it is that we will be able to predict ahead of time all of the ramifications of those changes. Radicals on the left have generally rejected this pessimistic vision of human possibility. Particularly in the Marxist tradition, radical intellectuals have insisted that wholesale redesign of social institutions is within the grasp of human beings. This does not mean, as Marx emphasized, that detailed institutional "blueprints" can be devised in advance of the opportunity to create an alternative. What can be worked out are the core organizing principles of alternatives to existing institutions, the principles that would guide the pragmatic trial-and-error task of institution-building. Of course, there will be unintended consequences of various sorts, but these can be dealt with as they arrive "after the revolution." The crucial point is that unintended consequences need not pose a fatal threat to the emancipatory projects themselves. Regardless of which of these stances seems most plausible, the belief in the possibility of radical alternatives to existing institutions has played an important role in contemporary political life. A good argument can be made that the political space for social democratic reforms was, at least in part, opened up because more radical ruptures with capitalism were seen as possible, and that possibility in turn depended crucially on many people believing that radical ruptures were workable. The belief in the viability of revolutionary socialism, especially when backed by the grand historical experiments in the USSR and elsewhere, enhanced the viability of reformist social democracy as a form of class compromise. The political conditions for progressive tinkering with social arrangements, therefore, may depend in significant ways on the presence of a more radical visions of possible transformations. This does not mean, of course, that false beliefs are to be supported simply because they are thought to have desirable consequences, but it does suggest that it is important to seek firm foundations for plausible visions of radical alternatives. We now live in a world in which these radical visions are mocked rather than taken seriously. Along with the post-modernist rejection of "grand narratives", there is an ideological rejection of grand designs, even by those still on the left of the political spectrum. This need not mean an abandonment of deeply egalitarian emancipatory values, but it does reflect a cynicism about the human capacity to realize those values on a substantial scale. This cynicism, in turn, weakens progressive political forces in general. The Real Utopias Project is an attempt at countering this cynicism by sustaining and deepening serious discussion of radical alternatives to existing institutions. The objective is to focus on specific proposals for the fundamental redesign of basic social institutions rather than on either general, abstract formulations of grand designs, or on small reforms of existing practices. This is a tricky kind of discussion to pursue rigorously. It is much easier to talk about concrete ways of tinkering with existing arrangements than it is to formulate plausible radical reconstructions. Marx was right that detailed blueprints of alternative designs are often pointless exercises in fantasy. What we want to achieve is a clear elaboration of the institutional principles that inform radical alternatives to the existing world. This falls between a discussion simply of the moral values that motivate the enterprise and the fine-grained details of institutional characteristics. In practical terms, the Real Utopias Project is built around a series of workshop conferences sponsored by the A. E. Havens Center for the Study of Social Structure and Social Change at the University of Wisconsin. The general format of these conferences consists of selecting a provocative manuscript that lays out the basic outlines of a radical institutional proposal and then inviting 15-20 scholars to write essays that in one way or another address this document. These essays have ranged from short, point by point critiques of specific arguments to longer papers developing one or more of the themes of the focal manuscript. The essays are then circulated to all participants in the conference well in advance of the gathering so that the discussions of each paper at the conference are informed by the arguments raised by the entire set. After the workshop is over, participants have an opportunity to revise their essays before they appear as a collection in the Real Utopias Project series published by Verso. All royalties from the The Real Utopia Project books go into a fund to support future conferences and books. 2. Secondary Associations and Democratic Governance (1992). This conference engaged a complex and important manuscript by Joshua Cohen and Joel Rogers on the problem of democratic governance in capitalist societies. The central issue of discussion was the potential for enhancing both the effectiveness and the democracy of democratic capitalism by institutionalizing a pervasive governance role for nonstate, quasi-voluntary secondary associations. Some of the papers from this conference appeared in a special issue of Politics & Society (December, 1992). The entire set of papers appears as the first volume of the Real Utopias Project Verso series, Associations & Democracy (1995). 3. A model for Market Socialism (1994). This was the first conference organized around a book rather than a paper: John Roemer's, A Future for Socialism (Harvard University Press, 1994). The conference explored Roemer's proposal to create a form of market socialism in which there were two kinds of money -- dollars for the purchase of commodities and coupons for the purchase of shares in firms. The core of the proposal is that (a) these coupons are initially equally distributed to all adults and then used to buy shares which are subsequently traded on a coupon-share market; (b) coupons cannot be sold for dollars, so that dollar wealth cannot be converted into coupon wealth and coupon wealth cannot be directly converted into dollar wealth; (c) share ownership, denominated in coupon values, gives people property rights in the dollar profits of firms in the form of dividends. A subset of the papers appears in Politics & Society (December, 1994), and the entire set as the second volume in the Verso series, Equal Shares (1996). 7. Pensions and the Control of Capital Accumulation (2004). This conference explored the question of whether or not large pools of capital that have a public or quasi-public character, especially pension funds, could be used as a mechanism for enhancing the social accountability of capital accumulation. The opening paper in the conference by Robin Blackburn, “Pension Provision: The Crisis and Outline of an Alternative,” explores alternatives models of pension provision – both public and private -- and their prospects for adequately contending with the impending crisis of pension systems in the 21st century, and then proposes a specific kind of strategy for both dealing with this crisis and using pensions as an instrument for enhanced democratic control of accumulation. Two of the papers from the conference were published in the journal Politics & Soicety. 8. Institutions for Gender Egalitarianism: Creating the Conditions for Egalitarian Dual Earner / Dual Caregiver Families (2006). This conference examined the problem of how design of public institutions could facilitate egalitarian gender relations within the family over both caregiving and employment. The conference was anchored by Janet Gornick and Marcia Meyers’ essay “Institutions that Support Gender Egalitarianism in Parenthood and Employment.” They argue that in order to reconcile in an egalitarian manner the interests of men, women and children within the emerging dualearner/ dual-caregiver model of the family, three clusters of institutional innovations are needed: 1) a generous mechanism of paid parental leaves for caregiving activities which is allocated to mothers and fathers individually, thus requiring fathers to “use or lose” their paid leave time; 2) effective working-time regulations that limit full-time work hours and raise the quality and availability of reduced-hour work; and 3) an expansive, universal program of early childhood education and care. The papers from the conference were published in the sixth volume in the Real Utopias Project series, Gender Equality: transforming family divisions of labor (2009). 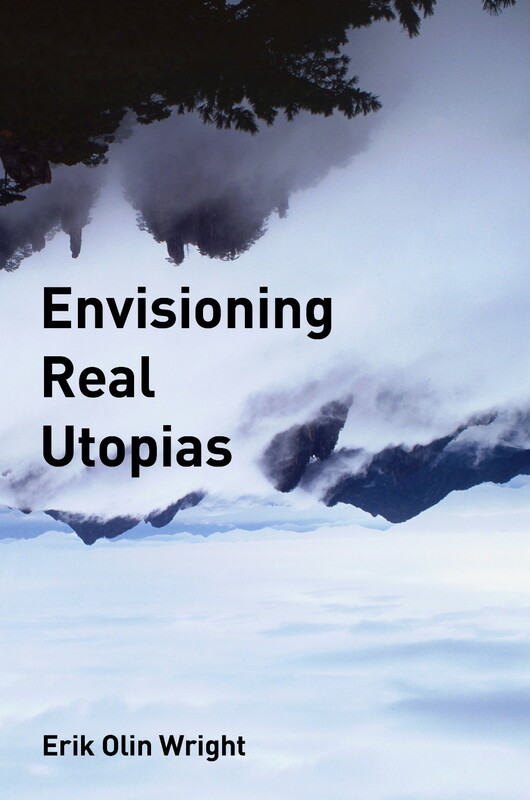 Envisioning Real Utopias, by Erik Olin Wright (London and New York, Verso, 2010). This books elaborates a general framework for the entire RealUtopias Project. An article that summarizes the core ideas of the book appeared in New Left Review "Compass Points: towards a socialist alternative", New Left Review 41 September-October, 2006, pp. 93-124.